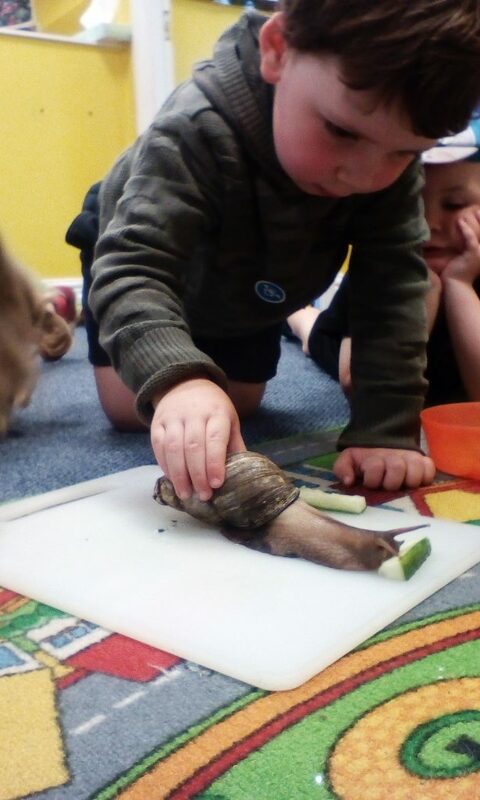 In the Little Bumble room we have been looking after our pet snail Sammy, the children looked closely at Sammy munching on the juicy cucumber. Some children even held Sammy and then described his texture and how he felt on their hands. Many children were eager to find out where Sammy’s eyes were! Rachel brought in some snake skin that her pet snake Toby had shed, at her group time the children found out lots of information and asked lots of questions about what the snake ate, how big he is and his colour. We used both these activities to promote awareness of hygiene and hand washing. The activities all brought to the children’s attention how we should care for different animals.